The ‘bioprobes’ group within the team is developing new probes and techniques— all of which involve some element of synthetic or semi-synthetic chemistry— which can be applied to a number of problems in chemical biology, including the analysis of protein complexes. Catalyzed by kinases, Ser/Thr and Tyr phosphorylation is a vital mechanism of intracellular regulation. With more than 500 different kinases encoded in the human genome, however, closely related enzymes will inevitably phosphorylate some of the same substrates. 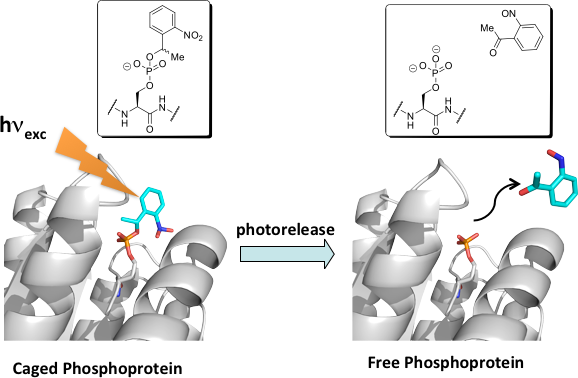 Thus, simple, sensitive and selective tools for monitoring target kinase activities are invaluable in academic and pharmaceutical settings. In order to address issues of assaying ease we are developing reporters of kinase activity that exploit the chelation-enhanced fluorescence of the sulfonamido-oxine (Sox) family of chromophores. 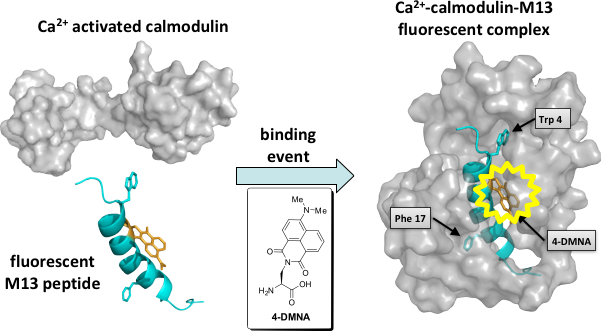 This fluorescence-based method allows us to design highly selective chemosensors either by synthesizing peptide- or protein-based probes for virtually any kinase of interest. This work can be applied for new drug discovery in a high-throughput manner, and also for unraveling the multifarious signaling cascades in which these enzymes are pivotal. Current efforts focus on the design and synthesis of next generation probes, based upon the chelation-enhanced fluorescence strategy, that show ideal photophysical properties for cellular imaging and highly miniaturized devices. Fluorescence spectroscopy has become one of the most extended tools for the development of new probes for ions, small molecules, and monitoring biological processes, like protein folding, distribution of biomolecules inside cells, protein-protein interactions, phosphorylation events, etc. Many of the applications rely on the use of natural fluorophores. However, the development of new extrinsic fluorophores remains an essential element for the design of new fluorescent probes. Environment-sensitive fluorophores are a special class of molecules that have spectroscopic properties that are dependent on the physicochemical properties of their environment. Particularly useful are the fluorophores that display sensitivity to the polarity of the local environment, like Prodan, 4-dimethylaminophthalimide (4DMAP) or 4-amino-1,8-naphthalimide (6DMN) derivatives. These molecules generally exhibit low quantum yield in aqueous solution, but become highly fluorescent in nonpolar solvents or when bound to proteins or membranes. We have synthesized new environment-sensitive fluorophores, 4-DMAP and 6DMN, which displays convenient fluorescent properties for biochemical studies: long excitation and emission wavelengths, high quantum yield, and large Stokes shift (more than 200 nm depending on the polarity of the environment). 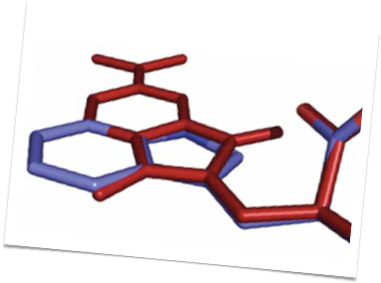 Lanthanide-binding tags (LBTs) are small, genetically encodable, and versatile protein fusion partners that selectively bind lanthanide ions with high affinity. 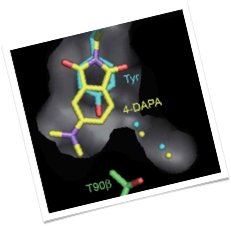 Evolved from Ca(II)-binding loops, LBTs feature strategically positioned tryptophan residues that can sensitize Tb(III) luminescence. LBTs thus have the potential for use in varied applications, such as luminescence spectroscopy, luminescence resonance energy transfer, X-ray crystallography and NMR spectroscopy. We have recently expanded the scope of LBTs by incorporating sensitizers other than tryptophan, which can sensitize both Tb(III) and Eu(III) luminescence using longer wavelength excitation. The structural work in this project has been made in collaboration with the group of Prof. Karen Allen at Boston University. Caged peptides and proteins are powerful chemical tools that provide temporal and spatial control for examining complex signaling pathways in a UV-inducible manner. Current efforts in this area focus on the incorporation of caged residues into full length proteins through expressed protein ligation. 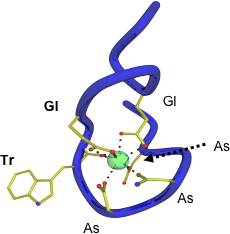 Targets include the myosin regulatory light chain, which is synthesized with caged phosphoserine to facilitate the study of phosphorylation-mediated myosin regulation, and Rac1, which is generated with caged asparagine to further elucidate its role in cell migration. In line with developing tools that offer spatial and temporal control over discrete signaling networks, efforts are also underway to develop new fluorescent tools that can provide detailed information about the dynamics of key protein interactions involved in these pathways. A variety of strategies for incorporating environment sensitive fluorophores into proteins are currently being explored. By incorporating these fluorophores into a protein at or near the interface of a particular protein-protein interaction, the probe may exhibit dramatic changes in fluorescence indicating the occurrence of a binding event. Recent studies of the new fluorescent amino acid, 4-N,N-dimethylamino-1,8-naphthalimidoalanine (4-DMNA) with the calcium-binding protein calmodulin have shown this to be an extremely powerful method for future applications in cell biology and protein biochemistry.